Cockroaches, cucarachas as some people call them, are among the most common of insects. Fossil evidence indicates that cockroaches have been on earth for over 300 million years. They are considered one of the most successful groups of critters. Because cockroaches are so adaptable they have successfully adjusted to living with humans. About 3,500 species of cockroaches exist worldwide, with 55 species found in the United States. Only 3 species are common pests in southern Nevada structures. These are the German, American, and Oriental cockroaches. The German cockroach is a widely distributed urban pest. It is the most common cockroach species in houses, apartments, restaurants, hotels, and other establishments. This is true not only in Las Vegas but also throughout the United States and in most parts of the civilized world. Because the German cockroach prefers to be inside a structure they are a year round pest. Adult German cockroaches are 1/2 to 5/8 inch long and tan to light brown. The German cockroach is best identified by its small size and by two dark parallel lines running from the back of the head to the wings. They are usually found in kitchens near dishwashers, stoves, and sinks and in bathrooms of homes. German cockroaches usually prefer a moist environment with a relatively high degree of warmth. Many people find that the German cockroaches are living in their electronics such as coffee makers, microwaves, and telephones. As with other cockroach species, German cockroaches are mostly active at night when they forage for food, water, and mates. During the day they hide in cracks and crevices and other dark sites that provide a warm and humid environment. Their relatively wide, flat bodies enable them to move in and out of cracks and narrow openings with ease. They may be seen during the daytime, particularly if a heavy population is present. The German cockroach is the most successful of the species infesting buildings in Las Vegas. There are several reasons for this cockroach’s persistence and the difficulty of controlling it. German cockroaches produce a larger number of eggs per capsule and they undergo the shortest time from hatching until sexual maturity, resulting in a rapid population growth. A greater number of nymphs hatch successfully because the female carries the egg capsule during the entire time the embryos are developing within the eggs. Also, and most importantly, German cockroaches are smaller than most other cockroaches and can conceal themselves in many places inaccessible to individuals of the larger species. German cockroaches produce odorous secretions that can affect the flavor of various foods. When cockroach populations are high, these secretions may result in a characteristic odor in the general region of the infestation. Disease-producing organisms such as bacteria, protozoans, and viruses have been found on cockroach bodies. 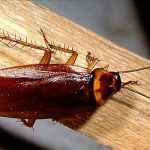 Different forms of gastroenteritis (food poisoning, dysentery, diarrhea, and other illnesses) appear to be the principal diseases transmitted by German cockroaches. The organisms causing these diseases are carried on the legs and bodies of cockroaches and are deposited on food and utensils as the cockroaches forage. Cockroach excrement and cast skins also contain a number of allergens to which many people exhibit allergic responses, such as skin rashes, watery eyes and sneezing, congestion of nasal passages, and asthma. American cockroaches are sometimes called waterbugs even though they are not aquatic bugs and are often mistaken as palmetto bugs. American and oriental cockroaches are seasonal cockroaches that appear in the warmer months of spring and summer in Las Vegas, North Las Vegas, Henderson, and Boulder City, NV. American cockroaches are much larger than German cockroaches and are about an inch and a half in length as adults. They prefer to live outside but occasionally will enter the home. They are reddish brown in color. Oriental cockroaches are also sometimes called waterbugs because they prefer dark, moist places. They are a little smaller than American cockroaches and as adults are around an inch in length. Oriental cockroaches also prefer to live outside because of the warm weather here in Las Vegas, North Las Vegas, Henderson, and Boulder City, NV but occasionally enter the home. They are dark brown to black in color as adults and have some red color on them when they are younger. PEST CONTROLCockroaches are the most common insects where we can find in our homes, offices etc. They have been found to be an source of allergy problems in people.